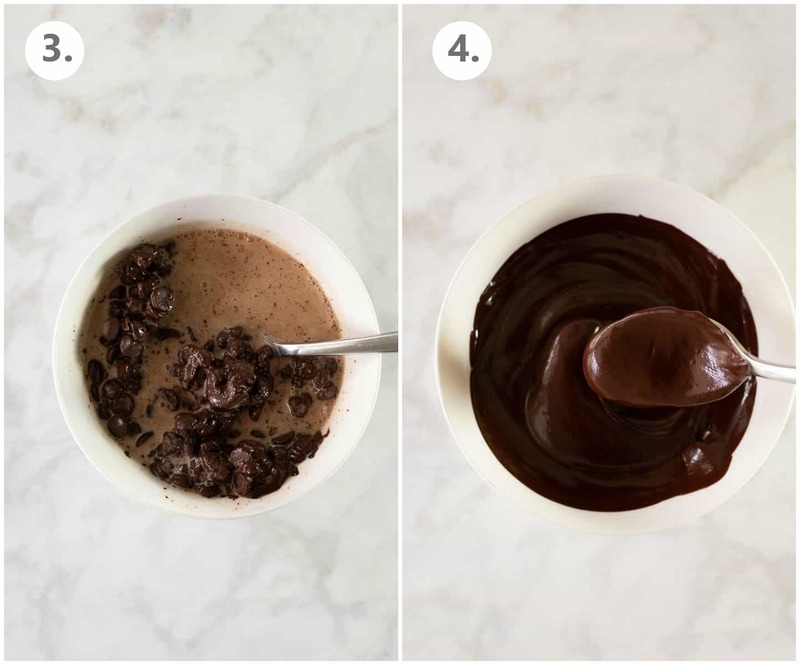 An EASY method for making chocolate fondue at home! 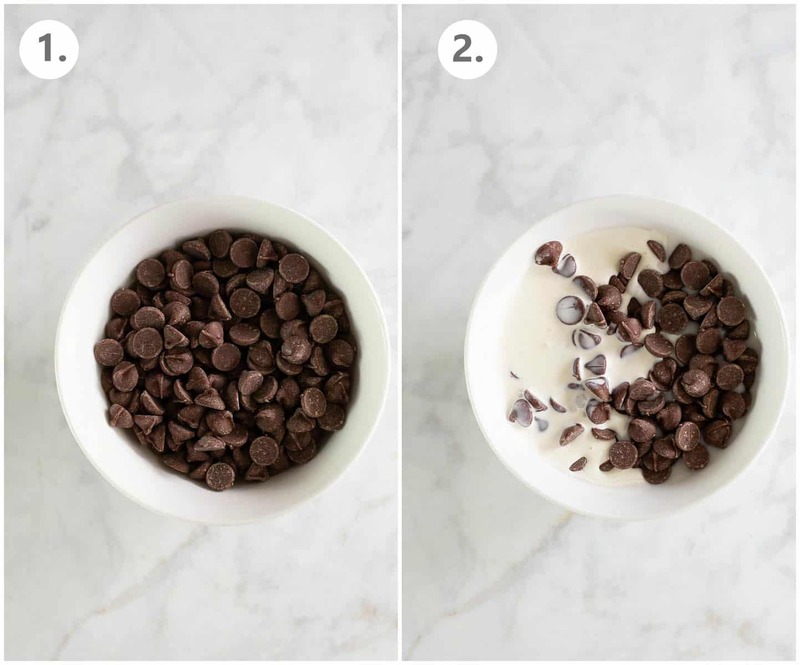 Whether you want dark, milk or white chocolate fondue – this method is fool-proof! Rich, DECADENT and perfect for all the dipping. 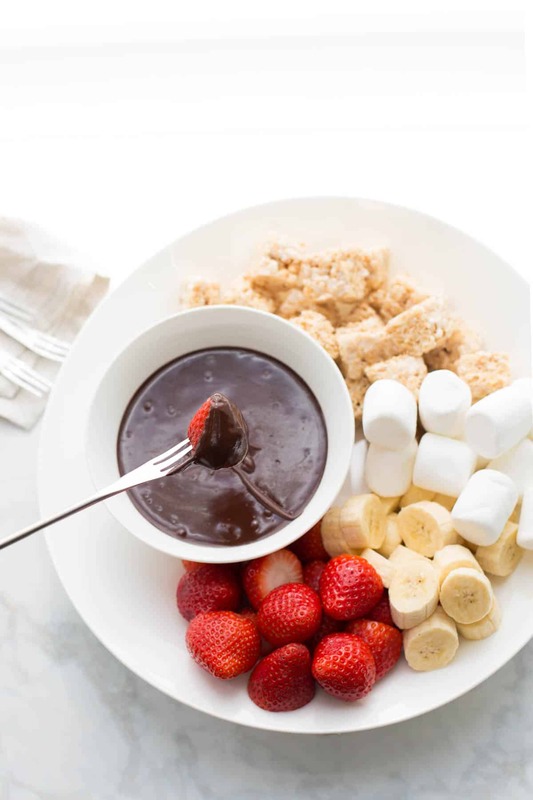 One of my family’s favorite Valentine’s Day traditions is chocolate fondue! We usually do it the weekend before Valentine’s Day and it’s a fun way to do something special with the kids. My kids LOVE fondue night and totally look forward to it. We usually end up having it a few other times a year too because it’s such a favorite! What could be better than luxrious, decadent melted chocolate with all kinds of things to dip? 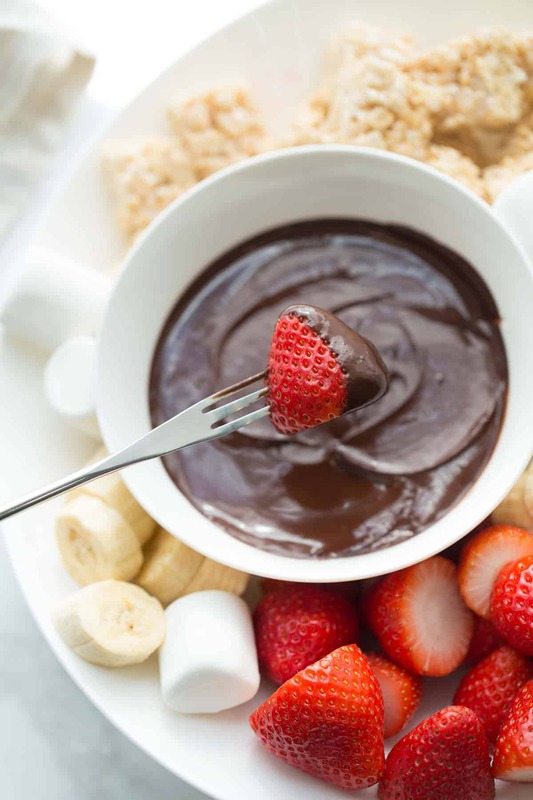 The great thing about fondue is you can use basically any chocolate you like! 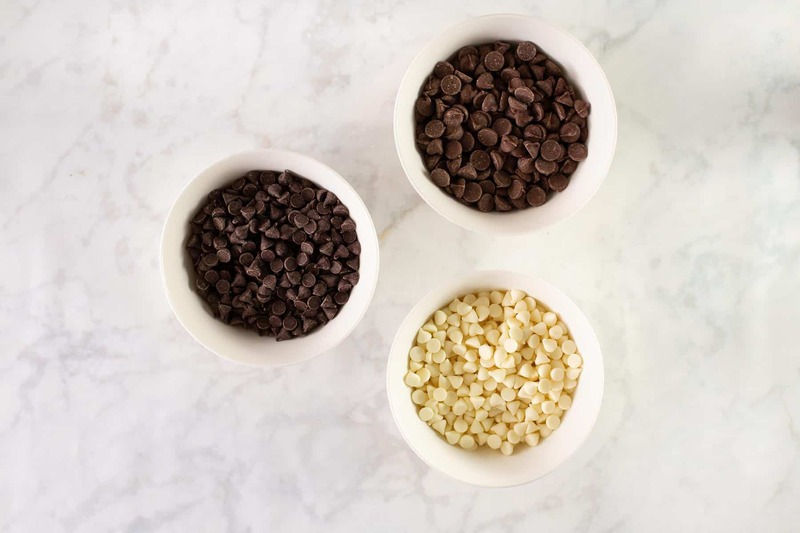 We’ve used everything from high-quality dark chocolate bars to regular old chocolate chips to make fondue. It’s always delicious! 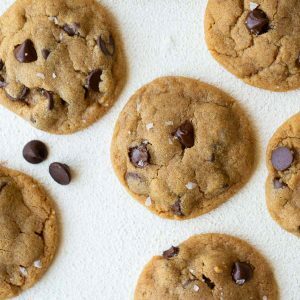 My personal favorite is to use semi-sweet chocolate chips. They lend the perfect sweetness without being overly sweet when paired with the dippers. The trick is the recipe will vary slightly depending on what type of chocolate you use. The white chocolate fondue needs less liquid than the dark chocolate fondue version. Tip: The amount of cream or liquid you add to the fondue will change based on what type of chocolate you use. See recipe below! 1. Pick your chocolate base. 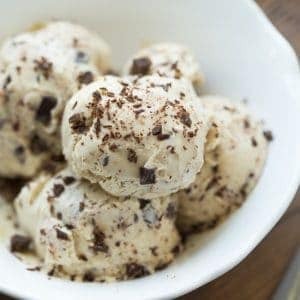 You can use chocolate chips or chopped cup chocolate bars. If you use a chocolate bar just be sure to chop it finely so it melts evenly. Pour the chocolate into a microwave-safe bowl. 2. Add your liquid. The amount of liquid you add will vary based on what kind of chocolate you’re using. See the recipe below for the correct amounts! I like to use a mixture of heavy cream and milk for dark or semi-sweet chocolate. 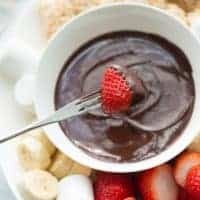 You can also easily make this chocolate fondue dairy-free with coconut and almond milk. We almost always make it dairy-free at our house! 3. Microwave on 50% power for 2-3 minutes, stirring every 30 seconds. It’s very important to use 50% heat here so you don’t heat the chocolate too quickly. Stirring every 30 seconds will also ensure you get glossy, smooth chocolate fondue. At first it will seem like your stirring isn’t doing anything – but it will get there! 4. Stop heating with the chocolate is totally smooth and melted. You may need to add a touch more cream (or liquid) to get just the right consistency. The thickness can vary based on what kind of chocolate you use. The perfect thickness is when the chocolate clings to a dipped banana, but isn’t totally thick. If the fondue is too runny simply add more chocolate and continue melting. Not too runny, not too thick. It’s more of an art than a science! Tip: You may need to add a touch more liquid to get just the right consistency. The thickness can vary based on what kind of chocolate you use. 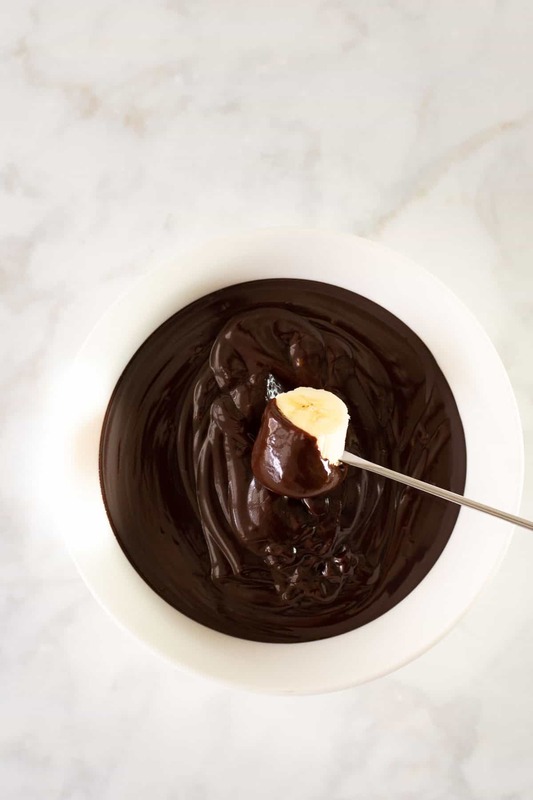 If the fondue is too runny simply add more chocolate and continue melting. Now on to the fun part! What to dip? The options are endless! This is why my family loves fondue night. 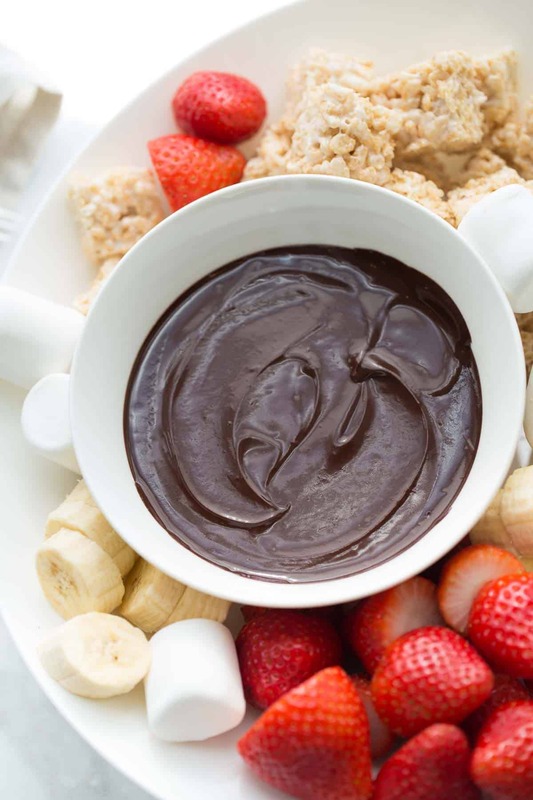 If you’re serving loved ones with food allergies a chocolate fondue spread can easily be made allergy-friendly. We always make ours gluten-free with naturally gluten-free things like strawberries and bananas as well as gluten-free cookies and gluten-free rice krispy treats! 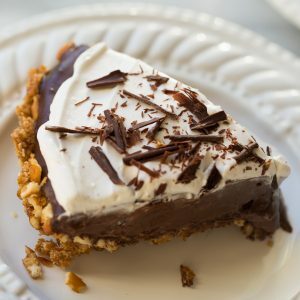 You can also use Enjoy Life Foods Dark Chocolate Morsels along with coconut milk and almond milk to make this undetectably dairy-free! I like using their dark morsels for a rich, luxurious chocolate fondue. There are few things in life better than a crispy rice treat coated in rich, smooth dark chocolate. Trust me on this! Love this recipe for all sorts of romantic occasions! Thanks for sharing this! This recipe inspired me. I’ve never done a fondue night before, but it was a HUGE hit. Who doesn’t love chocolate with basically everything. I’ve made this a few times now and it always turns out perfect! Thanks for all the tips!